Today marks our third month anniversary of moving out of an RV and into our new home. I think we’ve settled in pretty well. We’ve furnished our home with almost everything we need to be comfortable. We’ve gotten acquainted with folks in a couple different hiking clubs. We’ve placed our membership at the local church. We know several of our neighbors and have had guests over for dinner a couple times. We can drive without thinking about every turn to Lowe’s, the grocery, and Wal-mart. Gene’s even been to see his new doctor. We don’t feel so much like we’re new to the community any more. With all this connectedness, we find we’re busier, and happier, than we’ve been in a couple of years. Not that the full-time RV lifestyle was not a joy--it certainly was, but we missed being involved in a community. We are definitely involved now. Involved with our neighbors, involved with hiking, involved with church, involved with daily life. Not only are we busier with community connections, we have started to get back into some of our old habits which we put aside while on the road. Gene makes frequent visits to the local library now. He’s catching up on old hiking periodicals and has checked out several hiking and backpacking books. He’s also delved into the history of Maryville and Townsend area. I’ve gotten back into my cooking and have spent countless joyful hours in the kitchen. You already know we are spending much more time on the trail than would be considered normal. Some might even say we’re among the lunatic fringe. With all these other things going on in our lives, I think it’s time to give the blog a rest. I’ve struggled with this decision. Blogging has been fun and I’ve enjoyed sharing with you the places we’ve gone and the things we’ve seen. To be truthful, it requires more time than I want to give it right now. Perhaps I’ll pick it up again when we’re back on the road for our summer trip. So, until another time--happy trails and safe travels. Rocky Top--not the song, but the place. I’d venture to say that just about everyone in Tennessee is familiar with “Rocky Top”, that country/bluegrass tune recorded by the Osborne Brothers sometime in the late 1960s. Somehow, “Rocky Top” made its way into becoming one of the state songs in Tennessee and the marching bands of the University of Tennessee have filled, not only Neyland Stadium, but all of East Tennessee with the rousing chords of “Rocky Top” during every football season for the past 40 years. Contrary to popular belief, Rocky Top is not Neyland Stadium nor the University of Tennessee though you’d be hard pressed to prove that on game day. As far as I know, the song writers of Rocky Top didn’t have a specific place in mind, but a place definitely exists. 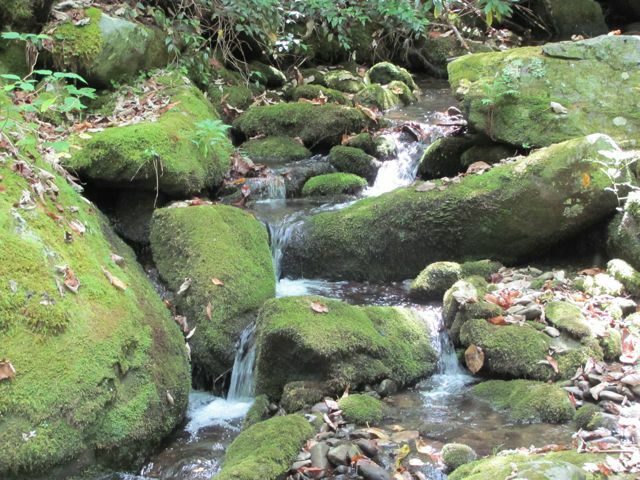 And, wouldn’t you know--it’s in Great Smoky National Park and it’s definitely UP hill. 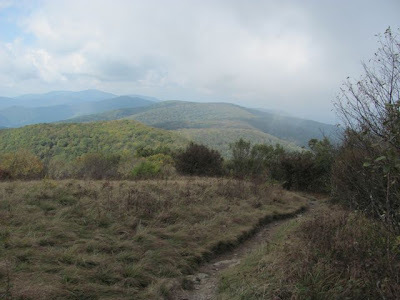 And, the best part of all (for me, at least) is the Appalachian Trail runs right across the top of Rocky Top. There are several ways to get to Rocky Top. Since Rocky Top is on the AT, it would be possible to walk there either from Springer Mountain in Georgia or Mt Katahdin in Maine. Allow plenty of time. Rocky Top sits high above Cades Cove on the Tennessee side and Fontana Lake on the North Carolina side of the Park. Any of the trails leading to the AT from either of those places will get you there. 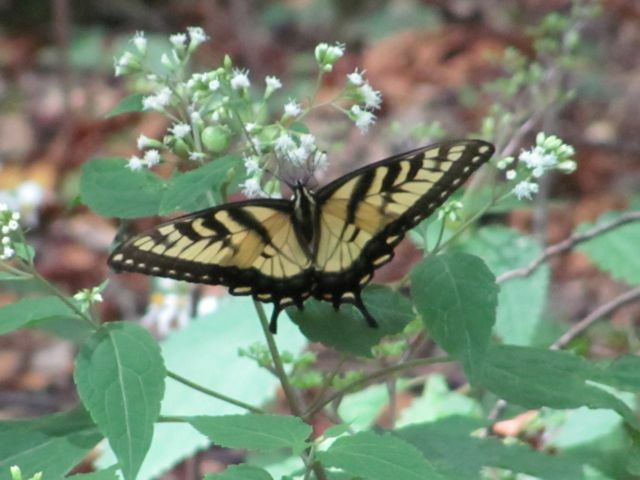 One popular route is to take Anthony Creek Trail from the back of the Cades Cove picnic area. Many hikers opt to create a loop by adding Russell Field Trail, the AT, and Bote Mountain Trail to Anthony Creek Trail with a little side trip to Rocky Top. Some strong hikers can do that 15-mile loop as a day hike, but most backpack and stay either at Spence Field or Russell Field shelters. These are all fine ways to get there, but we were looking for the shortest route since it was going to be a long, hard day hike for us. Our hike began at the Lead Cove trailhead. This is at that same parking lot we used several times recently for Turkeypen Ridge Trail and Finley Cane Trail. We were at the trailhead early and on the trail by 8 AM. Not many folks were out on this cool fall morning. Lead Cove trailhead is at 1700 feet in elevation and rises in 1.8 miles to 3000 feet where it junctions with Bote Mountain Trail. 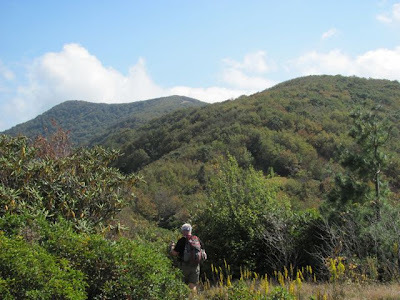 It’s a steady climb, but since we would be climbing all the way to our destination, we soon settled into a pace we could sustain for the duration. The trail junction sign at Bote Mountain was a welcome site and we quickly threw off our packs and had a seat on the ground for a short break. Bote Mountain was the next hurdle--2.9 miles with nearly 2000 feet of elevation gain. It helped me to think of this stretch in two sections. First was the 1.2 miles to the Anthony Creek Trail junction. 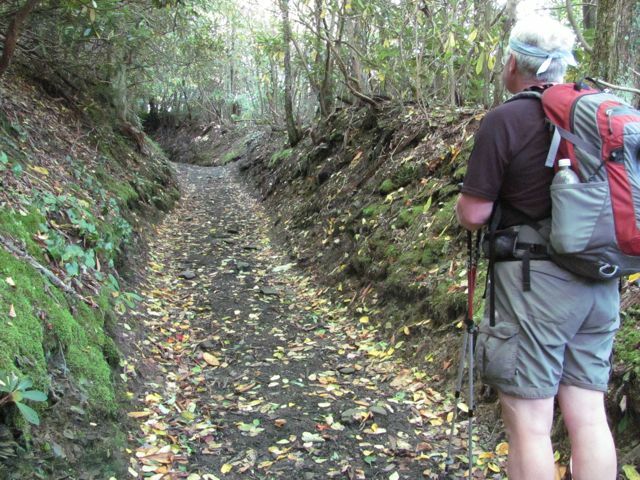 This section is typical of Bote Mountain Trail--the wide old roadbed. We continued our steady climb and were at Anthony Creek junction in good time, more than ready for another short break. Not far beyond this junction we came to a very wide spot in the trail. This was the end of the road for tourists coming up back in the days when Bote Mountain was still open to cars. Beyond this large turnaround, the trail narrows and begins the final 1.5 mile push to the top. Before the establishment of the National Park, this was a primary route used by farmers to herd their cattle for summer grazing at Spence Field. 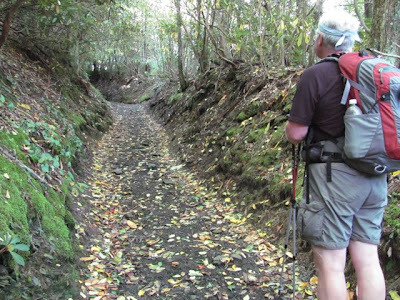 The trail is deeply eroded in this section; almost like walking in a gully. 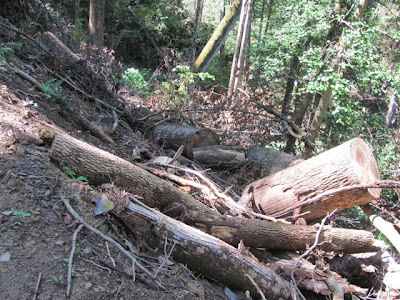 Of course, hikers, horses, and weather have played their part, but the cattle did the most damage. 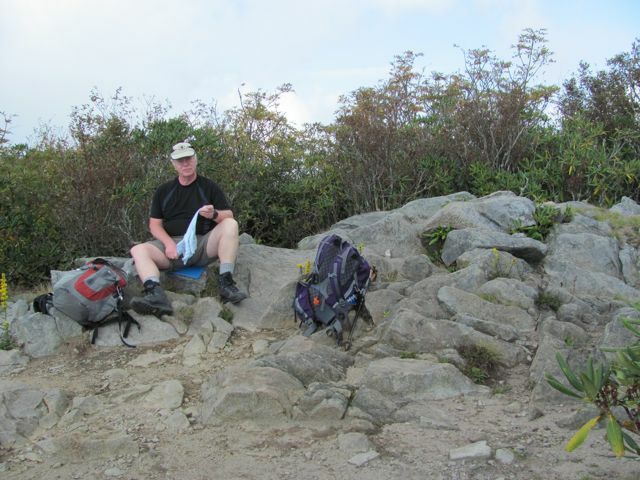 Another break was in order at the junction of Bote Mountain and the Appalachian Trail. To the right two-tenths of a mile is Spence Field Shelter. The shelter has been renovated as the other shelters in the Park. It would be a nice place for lunch, but we didn’t want to add the distance to our already long hike. To the left was our destination just about a mile away. This little mile section was our favorite as far as scenery goes. As you know, we love it at high elevation and this edge of Spence Field offered some open, grassy areas with magnificent views. Plus, it wasn’t all up hill for a change. From the junction with Bote Mountain the AT gently climbs 300 feet, but then quickly loses 200 of those feet before the steep 400 foot climb to the summit of Rocky Top. As we stepped onto the summit, I had the camera out to get what photos I could before the clouds moved in. We found a rock for lunch and enjoyed the splendor of these magnificent mountains over a cup of hot tea and a sandwich. 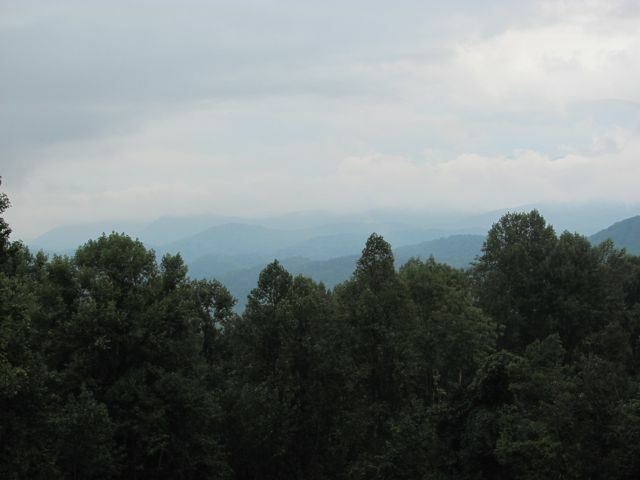 Thunderhead is just a short distance away, but we chose to sit on Rocky Top and rest our weary bones. What goes up must come down. We stayed as long as possible before packing up and starting the long journey to the car. We were two tired puppies at the end of the day, but, oh, what an awesome hike. We’ll savor the memories of this one for a long time. That’s all for today. Thanks for tagging along. We have finally gotten some much needed rain in East Tennessee this week. It’s just unfortunate that the rains came on the day Doug and Cheryl wanted to take in those gorgeous mountain views. The rain also caused us to take a little more time in selecting our hiking trail for Wednesday. Wanted to be sure our hike had the necessary foot bridges. Our pick turned out to be West Prong Trail. We’d done this trail earlier in the summer, but it has been closed due to storm damage since early in July. We noticed last week that it was open again. The trail is in excellent condition. 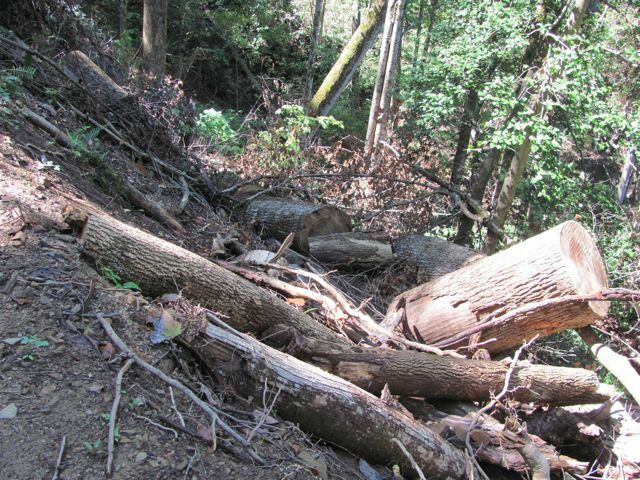 There were several areas where we noticed downed trees and about three places where the damage was significant. 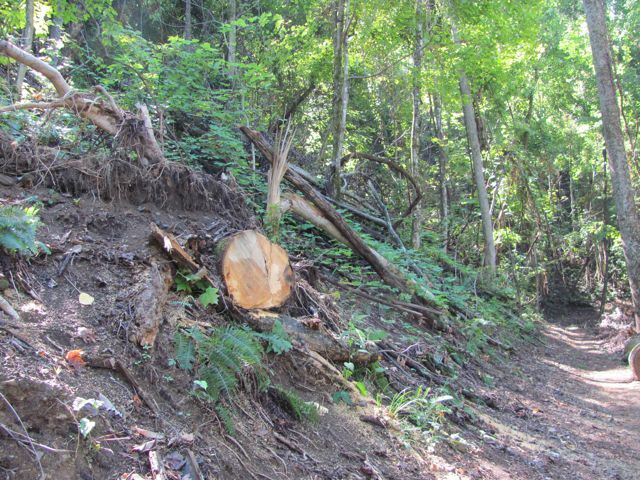 The blowdowns which were across the trail have all been cut and moved out of the way and the trail has been repaired. 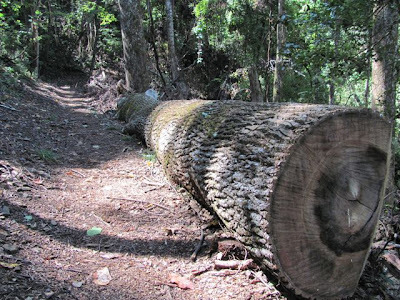 This log is going to be a nice resting log for a long time to come. West Prong Trail is 2.7 miles in length from the trailhead and parking lot just across the road from the Great Smoky Mountains Institute at Tremont to its junction with Bote Mountain Trail. This is a moderate hike with a little climbing to get the old heart racing, but not so much as to make the walk unpleasant. 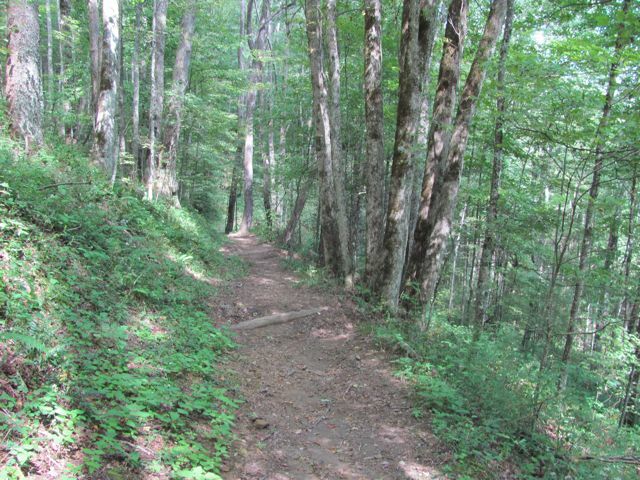 The trail gains about 600 feet in the first 1.25 miles then drops down 400 feet to West Prong and backcountry campsite 18. This is a large camping area with sites on both sides of the creek. The largest area is near the footbridge over West Prong. 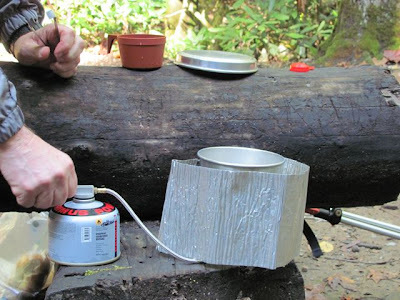 It is typical of most backcountry sites with a fire ring surrounded by logs for sitting and cooking and a pulley system to hang packs well out of the reach of bears, mice, and other varmint. However, to the left of this area and down a well trod path is another, more secluded campsite complete with fire ring and pulley system. Across the creek and to the right is another path which leads to yet another secluded site. It, too, has a fire ring and a single pulley. The map indicates campsite 18 will accommodate 12. There certainly is plenty of space here. We stopped for a short break and to take a good look around before crossing the footbridge and heading up the hill. From the campsite, the trail gains that 400 feet it lost earlier. 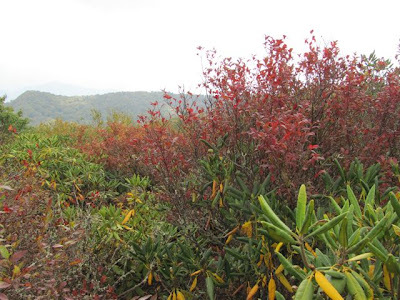 It’s a steady uphill climb through rhododendron and laurel. It would be absolutely gorgeous in early summer when these large shrubs are in bloom. 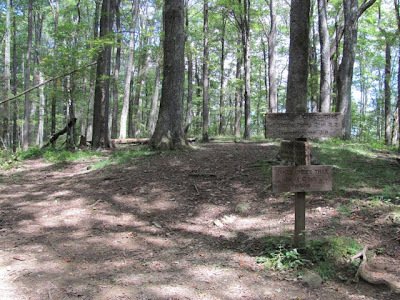 At 2.7 miles West Prong Trail ends at the junction with Bote Mountain Trail. Going right at this junction would take us 1.2 miles to Laurel Creek Road which would be a nice 8-mile hike. 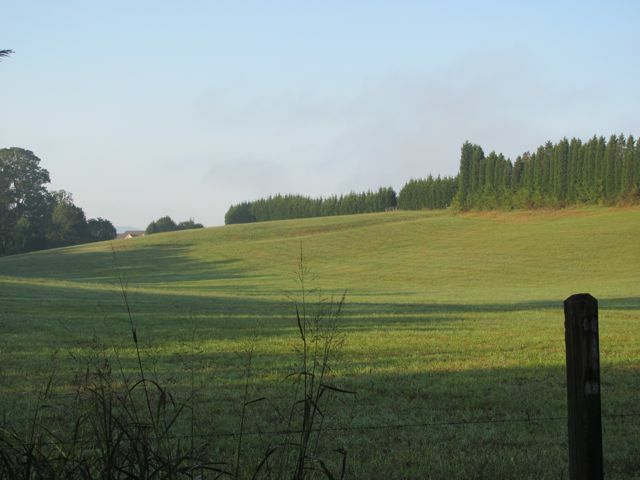 We opted to go left for just three-tenths of a mile to the junction with Finley Cane Trail. That gave us an even 6 miles for our round-trip hike. We were about 2000 feet on the Bote Mountain Trail. 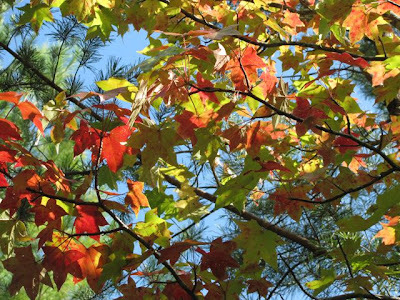 At that elevation, we saw the beginnings of some color in the leaves. This is a hike we’ll do often. As with our previous treks along this trail, we enjoyed it very much. One of the big advantages of having a stick and brick home over our small RV is the extra bedroom for guests. Since moving to Maryville, my folks have come for a weekend visit as well as Jack, Ansley, and Kayley. This past weekend, we’ve been hosts to Gene’s brother, Doug, and his wife, Cheryl. We haven’t seen them since last fall when we parked in their driveway on our way home from Alaska. It is such a thrill for us to have family (and friends) in our home. Doug and Cheryl arrived Sunday afternoon just shortly before the rain moved in. But, we weren’t going to let a little rain get in our way. Monday morning, bright and early (well, not so bright with all the clouds), we loaded in the car for a tour of Maryville, Pigeon Forge, Gatlinburg, the northwest side of the National Park, and Townsend. With the rather frequent downpours, we didn’t spend much time shopping in Pigeon Forge or Gatlinburg. We decided on the Old Mill area of Pigeon Forge and concentrated our efforts there, especially in the stop that sells locally made pottery. The rain really began in earnest by the time we got to Gatlinburg so we window shopped from the seat of the car. 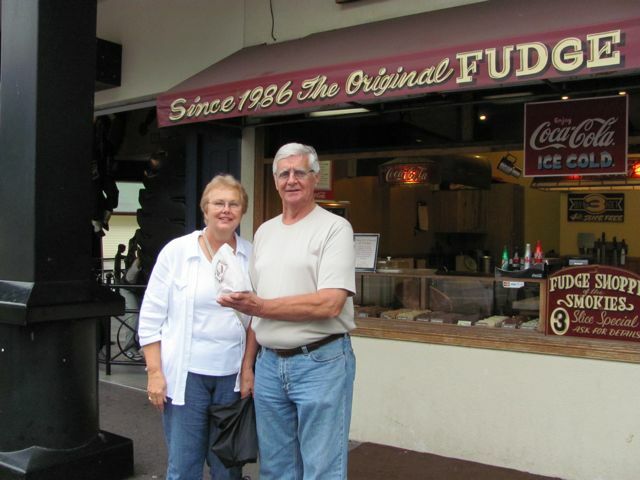 Of course, a trip to Gatlinburg is almost not complete without a little taste of freshly made fudge. That served to satisfy our sweet tooth for the rest of the day. Inside the National Park, our focus was on finding a bear. I’m always on the lookout for a bear, but Cheryl was especially anxious to see one since she has never seen a bear in the wild. We drove through the main entrance then past the Sugarlands Visitor Center. We opted to have our visitor center experience at Cades Cove. 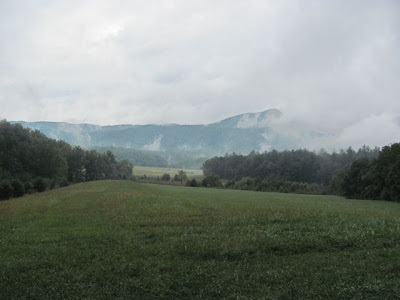 The twenty-five mile drive from Sugarlands to Cades Cove along Laurel Creek Road is a low-elevation drive and doesn’t offer many viewpoints. Fortunately for us, the rain let up just as we got to the cluster of pull-outs that do offer a view just before reaching the Laurel Falls trailhead parking. The rain had let up, but the clouds were still there to obscure our view of the higher peaks. The eleven-mile Cades Cove Loop Road is typically slow-moving, bumper-to-bumper traffic. Monday, partly because of the rain and partly because we’re between leaf season and summer vacations, there were very few cars on the road. We took it nice and slow, straining to see that elusive bear. At the back of the Loop Road, we stopped in the Visitor Center for a few minutes before continuing on. We got pretty wet, even with umbrellas, dashing back and forth to the car. On our way around the Cove we slowed down to take a look out the window and between the rain drops at the historic cabins. At one point, I thought for sure we’d found the bear, but it turned out to be a turkey. He was sorta folded in on himself creating a black lump. Guess he was tired of the rain, too. We made our way through Townsend and finally back to the house. We were glad to get inside where we could stretch our legs without getting soaked to the bone. We spent most of our time inside the car for our 100-mile drive Monday, but we’re not complaining. 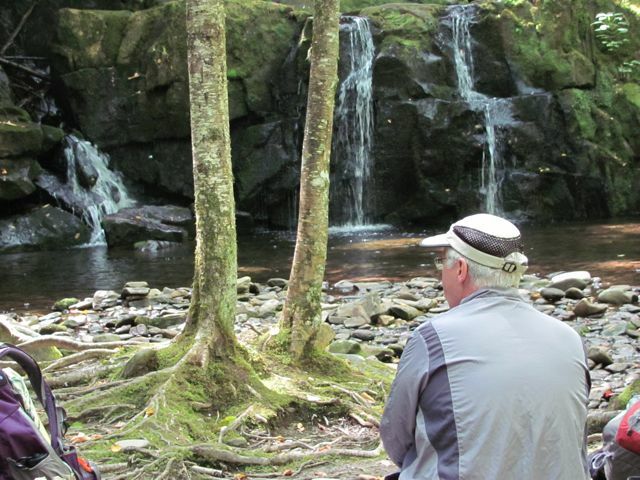 As far as I’m concerned, there are no bad days in the Smokies. Besides, being in the car almost all day gave us just that much more time to visit with each other. That’s what it was all about anyway. Gene and I want to welcome our latest follower, gmaburka. Glad you’re tagging along with us. 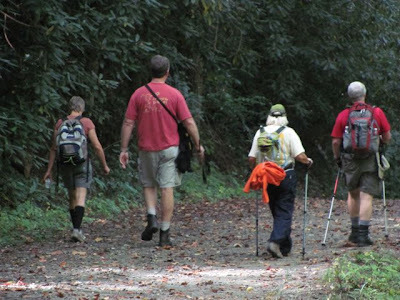 Tennessee Trails Association (TTA) is a statewide hiking club made up of several chapters across the state. 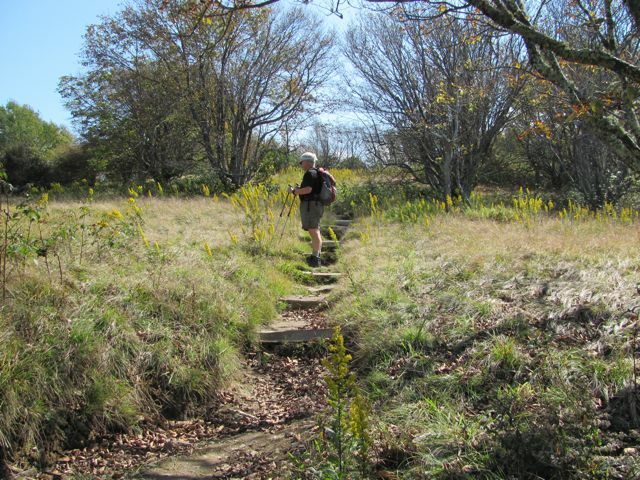 Each chapter usually offers a variety of hikes during each month so on any given weekend there will be several hikes to choose from. Today, two different chapters were hiking in the Smokies--East Tennessee and Upper Cumberland chapters. 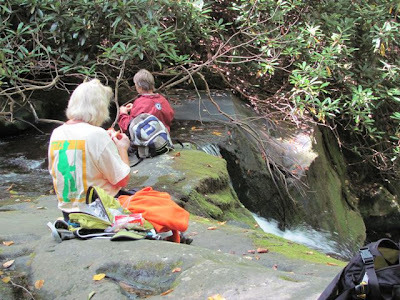 We’ve been wanted to hike with the East Tennessee group since we moved here, but hadn’t yet had an opportunity. Today was the day. Rosie, chapter chair for East Tennessee, was our leader today. She had a small group of only four other hikers, but I like the small groups best. It’s easier to have a “group” conversation and I feel like I get to spend more time with each one on the hike. The hike Rosie selected was Middle Prong. This is certainly not a new hike for us. I think we’ve hiked this trail three times, including today, in the past month or so. Because the hike was easy and only 8 miles in length, we didn’t get an early start. We met at the trailhead at 10 AM. I’m not going to repeat the description of this hike, since I’ve already done that twice in this blog recently. We hiked up to the Indian Flats waterfalls where we settled in on the rocks for our lunch break. Lynn Camp Prong drops three different times in this area before finally settling in for its run toward Middle Prong and the Little River. Where we had our lunch was between the first and second drops. As you can see from the photo, some in our group wanted to sit right on the ledge near the second drop. Others of us were more comfortable closer to the upper falls and away from the ledge. 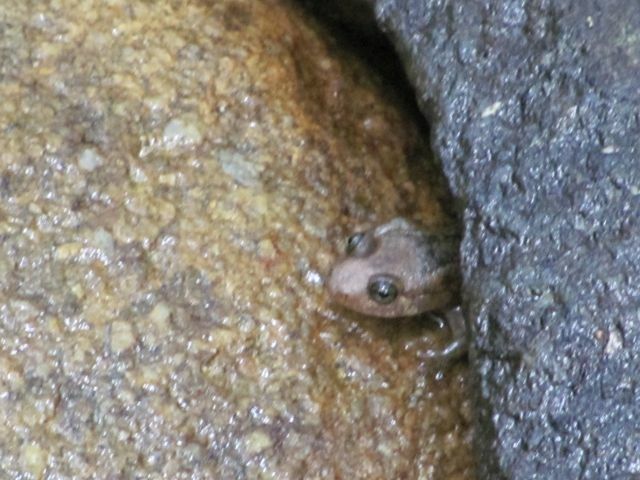 Among the rocks in the shallow water, I found this large seal salamander and this little guy tucked under the rock. 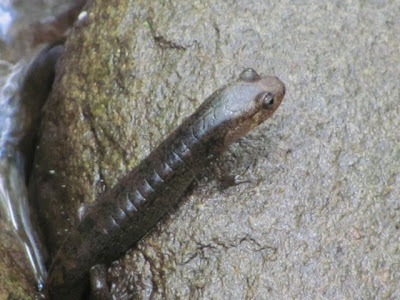 Great Smoky Mountain National Park is the “salamander capital of the world”. 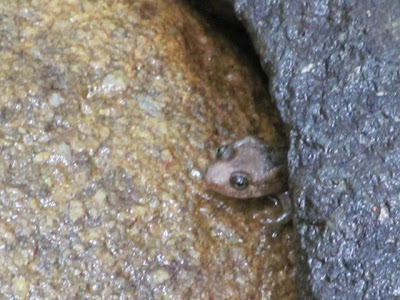 Five different families of salamanders can be found in the park and on any given day the salamanders will outnumber the humans in the park. Gene and I have been members of TTA for many years; he longer than me. Because we often hiked with different chapters, we knew many of the members across the state. Since we started RVing, however, we lost contact with almost all of these folks. We’re anxious to get back in the group again. 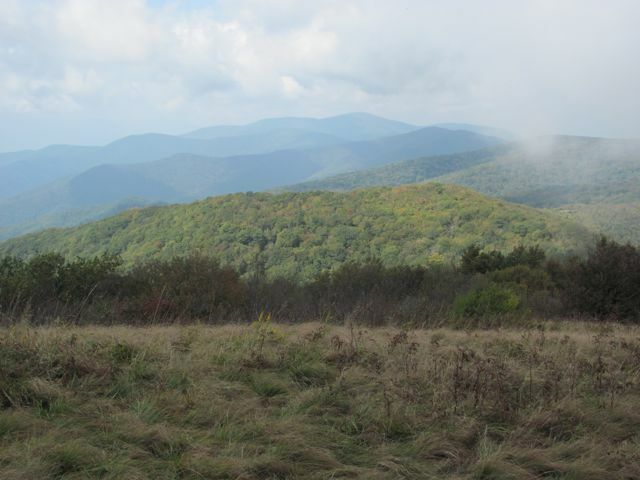 Today was a great start and we look forward to hiking with TTA, especially East Tennessee chapter, often. That’s it for today. Thanks for tagging along. Our hike up Jakes Creek Trail began near the Elkmont Campground in Great Smoky Mountain National Park. During the time before the establishment of the National Park, there were settlements in this valley as far back as the early 1800s. The logging companies had moved in by the early 1900s. After the logging companies had done as much damage as they could, the area was again claimed by settlers. A number of vacation homes are located in the vicinity of the parking lot and trailhead, but that a subject for a later post. Today is all about our hike. We have not hiked this trail in several years so were very surprised to find a large new parking lot. Actually, there are two parking lots and there is a new restroom facility in the lower lot. All of that is the good news. The bad news is that this parking lot is about four-tenths of a mile from the trailhead. Oh well, such is progress. I’m grateful for the restroom. 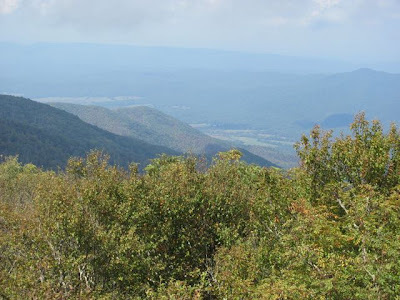 We began our hike by skirting around the locked gate which prevented us from accessing the old parking area, and started our climb toward Jakes Gap. The trail is wide, well graded, and graveled following first the old Jakes Creek Road then the track of the old logging railroad up Jakes Creek. The trail is gravel for about the first mile and a half before becoming the usual dirt path which we prefer. 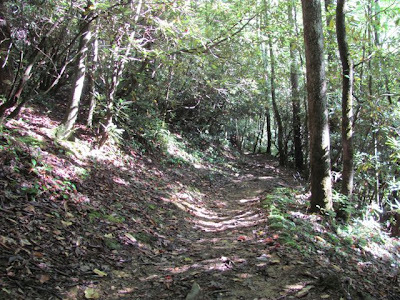 The trail climbs steadily (but never very steeply) for 1800 feet over its length of 3.7 miles. It is a pleasant walk through hardwoods, rhododendron, and magnolia. 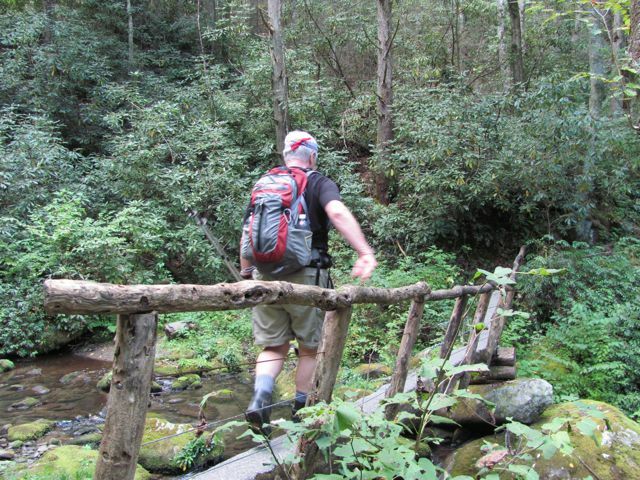 We had one stream crossing on a footbridge and a couple of easy rock hops. At the three mile mark we came to backcountry campsite 27. 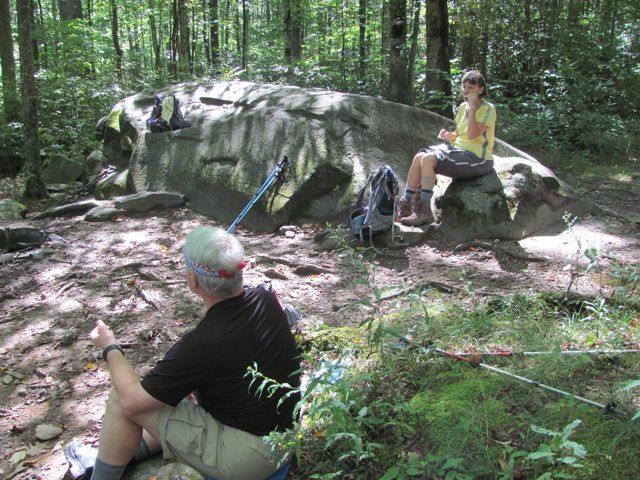 There is a huge boulder here and a very inviting place for a break. The guidebook indicates this campsite will accommodate 8 tents and the map says 12 plus horses. We spent a little time looking around. To us it didn’t look large enough for 8 much less 12 and we didn’t see a hitching post for horses. Perhaps we didn’t look carefully enough. 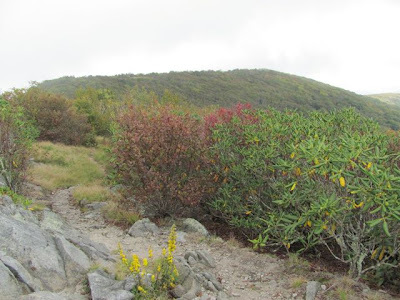 After our short break we continued the last seven-tenths of a mile to the top at Jakes Gap. Jakes Gap is the intersection for three trails. Entering the gap from Jakes Creek Trail we could go left up Miry Ridge Trail 5 more miles to the Appalachian Trail or we could go straight and head down Panther Creek Trail to Middle Prong and the Tremont area. The Panther Creek option would have been a nice 8.5 mile hike if we’d run a shuttle and left a car at the Middle Prong trailhead. Something to consider for another day. What we actually did when we got to Jakes Gap was pull up a log and had lunch. We retraced our steps to return to the car with a short side trip. On our way up the mountain, I had noticed a side trail leading off to the right of the main trail. Sharon was with us and she knew all about where that side trail led. 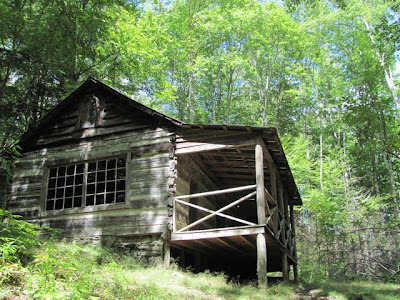 Apparently, very well hidden across the creek and back in the trees is the Avent Cabin, one of the best preserved and one of the oldest cabins in the Park. The trail to the Avent Cabin is not on any map that we’ve ever seen and it is not mentioned in the guidebook we use. 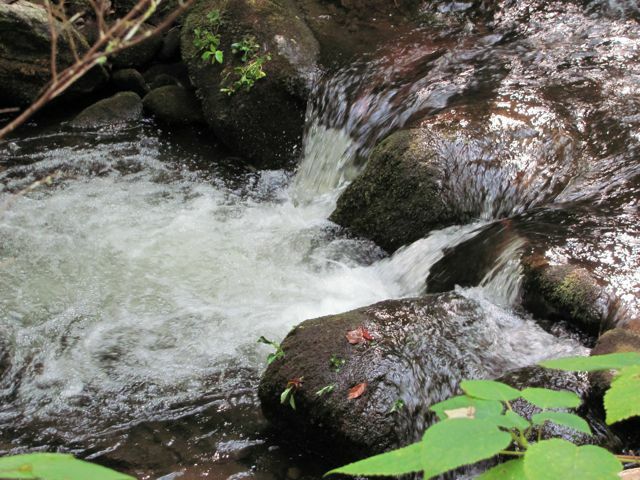 The trail to this little well-kept secret is maintained and even has a footbridge across the creek. Avent Cabin was originally built around the mid-1800s and was the home of Humphrey Ownby and remained in the Ownby family until 1918 when it was sold to Frank and Mayna Avent which they used as a summer cottage. Mayna is an accomplished artist and she used this small cabin as her summer studio. 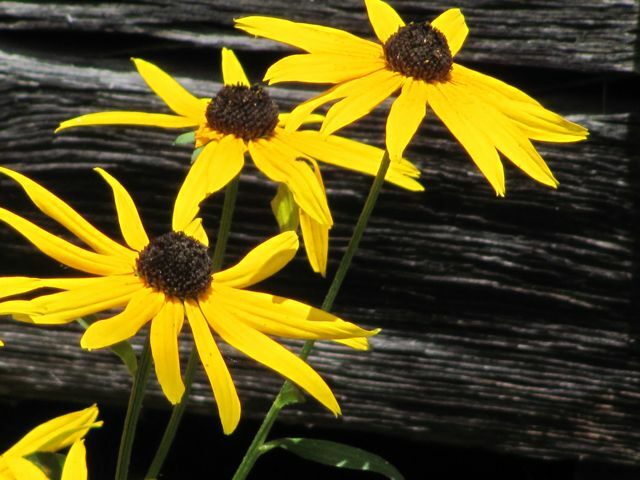 Sharon found this blog post about the cabin. Take a look if you’re interested. It has a much more complete story of Mayna Avent and some wonderful photos taken inside the cabin. 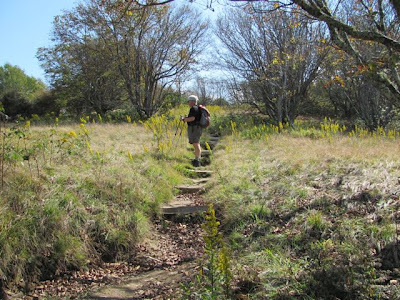 After exploring the cabin and the area surrounding it, we returned to the main trail and continued our trek downhill to the car. This was a wonderful hike. 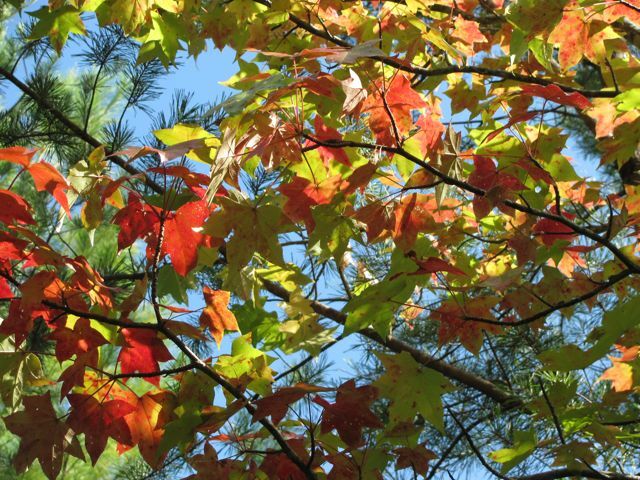 Our weather was perfect with almost a fall like feel in the air with temperatures near 50 when we started. The hike was pleasant and having Sharon along was great. 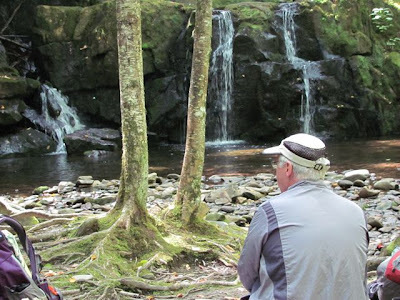 The side trip to Avent Cabin, a place we didn’t even know existed, was icing on the cake and if Sharon hadn’t been along to tell us what was down that path we would have missed it all together. Thanks, Sharon. That’s all for now. Thanks for tagging along. Some days there seems to be more to do than we can get done, certainly more than we can get done and also got for a hike. 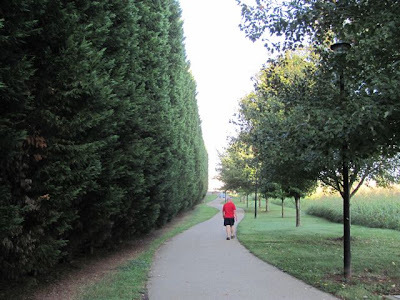 But on those days we still want to get a little exercise so we choose the Maryville Greenway. The Greenway is roughly a 4 mile paved path which winds its way around the city, in and out of several parks and neighborhoods. There are several parking areas along the length of the Greenway, making access convenient from all areas of town. The closest parking area to our home is less than 2 miles away. That’s a big advantage on those busy days when we’re out just for the exercise. We usually start our walk at one of the local parks. I like doing that because the parking lots are large and there is also a restroom--a handy thing both at the beginning and at the end of a walk. For our most recent walk, we started at Sandy Springs Park and walked to the end of the Greenway at Foothills School. That section was one and a quarter miles each way. After we got back to Sandy Springs Park we were not quite ready to stop so walked another mile in the opposite direction then back for a total of 4.5 miles. Not a mountain view, but nice nevertheless. The Greenway makes a couple small circles in various places and even a figure eight at the Greenbelt Park in downtown Maryville, but it is basically a linear trail. Being new to town, we usually do an out and back route, but that’s not necessary. Most of the major streets around town have sidewalks making many options for loop routes. Then there is the Greenway for the city of Alcoa. Their Greenway joins Maryville so I guess the proper name would be Maryville-Alcoa Greenway. There are 5 miles of trail in Alcoa, with additional miles planned. We have many choices for exercise walks on busy chore days. Welcome to Blue Roads to Hiking Trails. We are Gene, Judi, and Peanut the cat, and we are any time RVers in our Four Winds Class C motor home. Our passion is hiking and exploring the great outdoors. We are blessed in our retirement with good health and strong legs. Our desire is to see this country and to hike its trails. 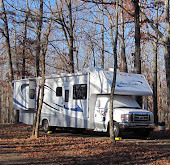 Our motor home allows us to be “at home” as we travel the “blue roads” to trailheads across America. 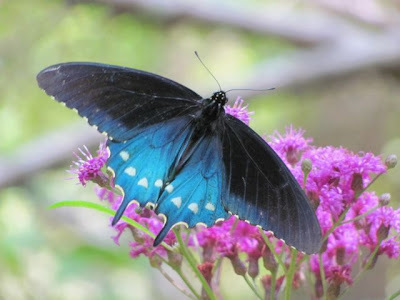 It is our goal through this blog to share some of our travel adventures, RV experience, hiking destinations, and, yes, some disasters in the hopes that we might be an inspiration and helpful resource for those who have an interest in travel, the RV lifestyle, and a love for the great outdoors. We invite you to tag along with us as we travel this journey. Who knows where it may lead, but one thing’s for sure--it will be an adventure. We love to hear from our readers so please leave us a message with your comments and suggestions.